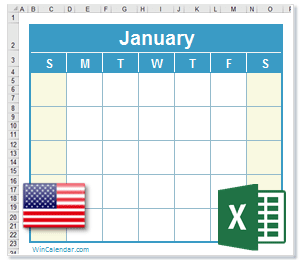 2016 Excel Calendars Templates with popular and US Holidays. Calendar files are in xlsx (macro-free) format and compatible with Google Docs and Open Office Calc. Calendars are blank and printable. They are ideal for use as a spreadsheet calendar planner. All calendar templates are now also OpenOffice compatible. Need to make a web page calendar? Just 'Save As' HTML from Excel. 2016 Calendar with US Holidays. Full year Weekly and Monthly layouts. For following year calendars with Holidays see:2017 Calendar with United States Holidays in Excel format, 2018 Calendar with United States Holidays in Excel format.For prior year calendars see:2015 Calendar with United States Holidays in Excel format.